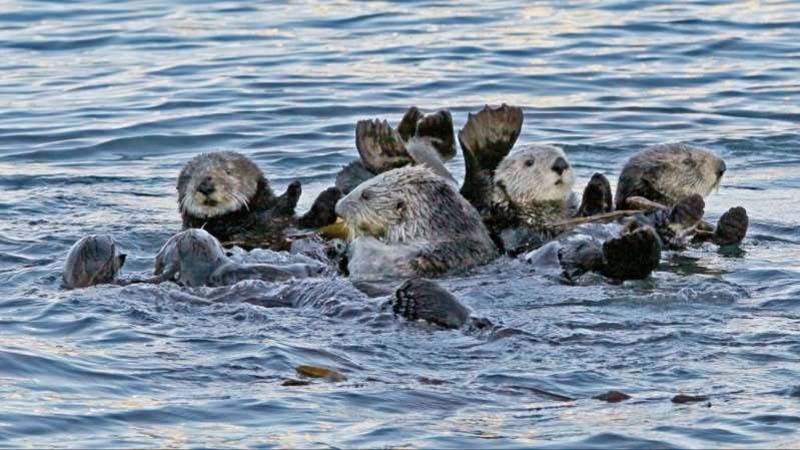 © Provided by Quartz a raft of sea otters floating in the ocean. Sea otters are arguably the most adorable-looking mammals of the sea. They’re also some of the hungriest. 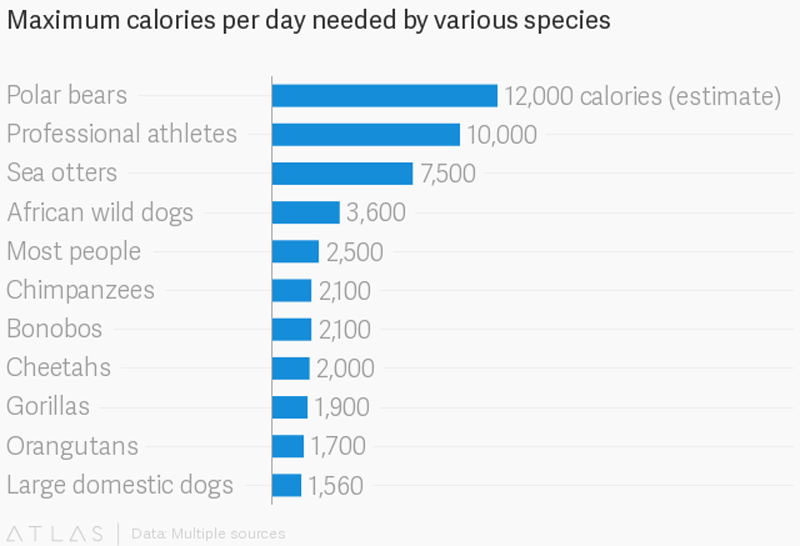 Even though adult sea otters tend to max out around 100 pounds (45 kg), these predators need about 7,500 calories per day—way more than most animals their size, and three times as much as the average human being. That amount of energy amounts to 25% of their body weight in food. Otters lack blubber, that big layer of juicy insulation for all other marine mammals. Instead, otters have to keep warm even in frigid waters entirely through their diet, which consists of sea urchins, mussels, crabs, clams, and the occasional slow-swimming fish. Scientists have often puzzled over how sea otters are capable of eating these foods in such massive quantities—particularly when many of these delicacies are on the ocean floor or in dark ocean waters. Sea otters can only dive for about five minutes, so they can’t go hunting for long periods of time. It’s been nearly impossible to study the phenomenon in the wild: Otters tend to get camera-shy when they know humans are watching and water can be so murky hidden cameras become useless, Sarah McKay Strobel, a graduate student in marine biologist at the University of California Santa Cruz, told Popular Science. Strobel and her team had an opportunity to work with a rehabilitated sea otter to try to understand its hunting skills. According to work published this week, it appears that sea otters have a heightened sense of touch (paywall) in their paws and whiskers they helps them distinguish food from rocks and sediment. Between 2014 and 2016, the team trained Selka, a rehabilitated sea otter then living at the UCSC Marine Laboratory and declared unfit to return to the wild, to explore an experimental setting that included a cabinet with a slot for her paw. Behind the slot were grooves of plastic that ranged from 2 to 5 mm (a millimeter is about the size of a pencil point). If Selka pressed on the 2 mm groove, she got a treat. Eventually, the research team introduced Selka to a blindfold. Selka grew accustomed to swimming around the experimental setting without sight, feeling the cabinet and grooves with her paws and whiskers. The team tested Selka’s ability to find the 2 mm groove by moving and replacing the smaller grooves over time. Feeling with just her paws and whiskers, it took her a fraction of a second to distinguish the 2 mm groove from a 3 mm groove and 2.1 mm groove, all in the same place. Most of the time, she didn’t even feel others to compare their sizes; she just appeared to know what the right size felt like. For comparison, members of the lab tried to feel out the same differences with their hands, and it took them about 15 seconds. The results of the experiment, carried out with one otter in a lab setting, are similar to outcomes of tests with seals, walruses, and manatees. “Our results suggest that sea otters are capable of using touch in this short amount of time to detect prey,” Strobel said in a statement. It’s likely they spend about 30 seconds of each dive actually feeling around the bottom of the ocean with their paws and whiskers looking for food.